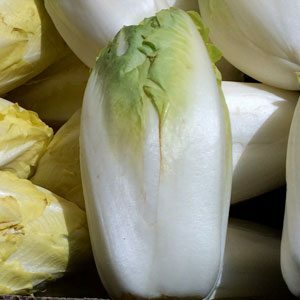 Witlof (‘white leaf’) chicory is a major vegetable in Europe, however not widely grown in Australia and very rarely grown in the home garden. We are not sure that you would really want to go to the trouble to grow it as it is complicated and probably one for the ‘Witlof’ enthusiasts only. It is sown as seed in winter and it is the blanching process that deters most gardeners from growing it. You grow the Chicory roots, store them and then replant them in the dark. Plants need to be stored, trimmed replanted in a hole or pot that can be filled with soil to keep out the light.